Hundreds of residents, both humans and animals alike, have been affected by a massive wildfire which continues to rage across California. But amid so much devastation, an unlikely survivor has emerged as a symbol of hope in a place where it's been so hard to come by. This week, firefighters battling the Valley Fire, north of San Francisco, made a startling discovery. 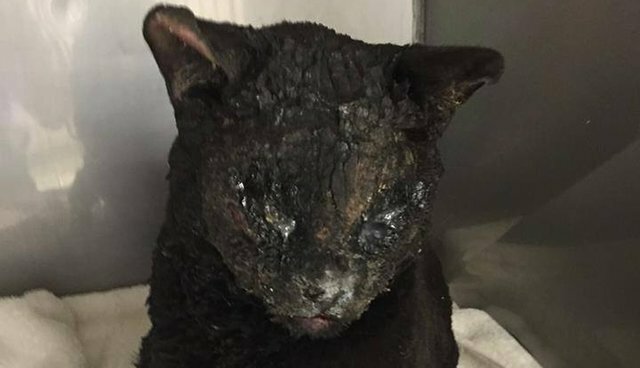 There, in one of the hardest hit areas, they found a black cat who somehow managed to survive on his own through the fast-moving blaze. He was rushed to the Wasson Memorial Veterinary Clinic in the city of Lakeport. 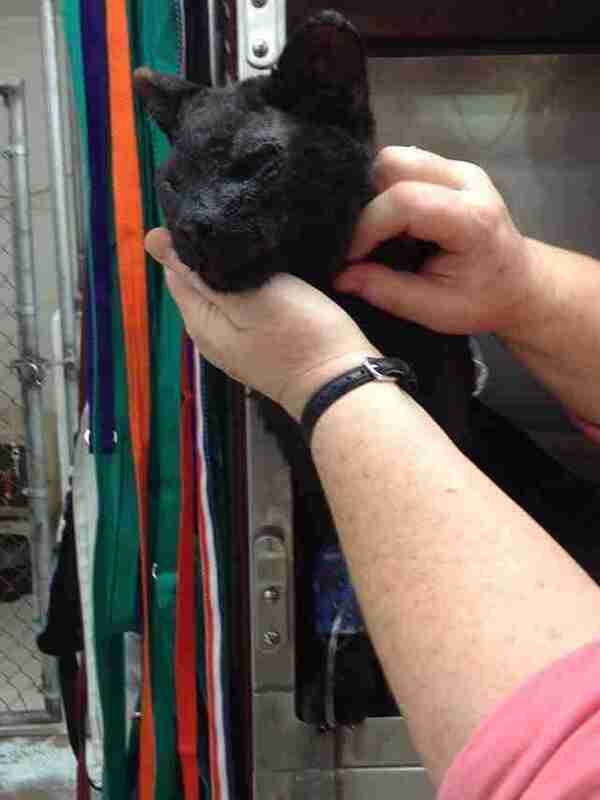 "He was brought in by the firefighter who found him," a staffer at the clinic told The Dodo. "He has suffered burns, primarily around his face, but all his hair has been singed." 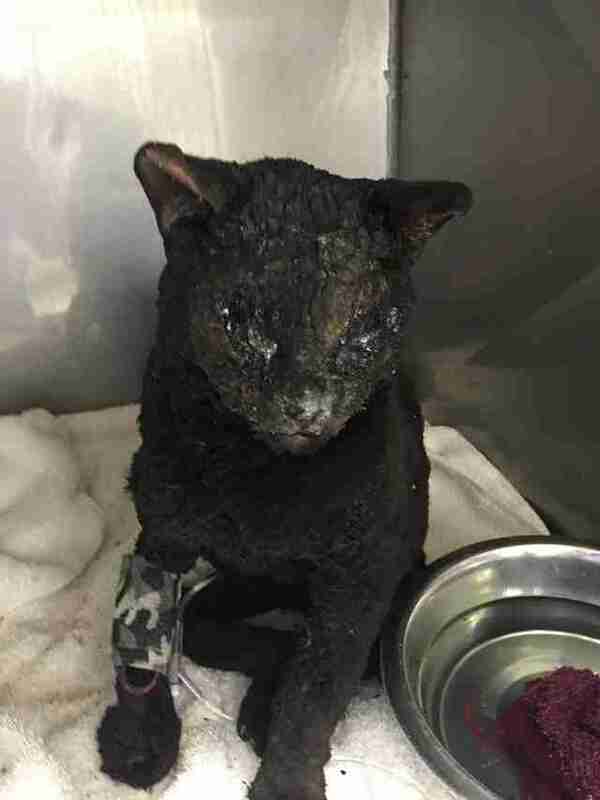 Veterinarians quickly set about treating the cat for his painful injuries, inserting a feeding tube to nourish him and applying burn cream to his face and body. Incredibly, despite all he's been through, the cat is said to be recovering well - both in body and spirit - thanks to the dedication of the medical workers who refused to see him as a lost cause. "He's doing great. He purrs and is happy to be pet. He seems to be just a really nice cat," the staffer said. "Here, the vets truly try to save every animal that comes in here. They have the biggest hearts out of anybody you've ever met. Any animal that comes in here is given the absolute best chance they can have. 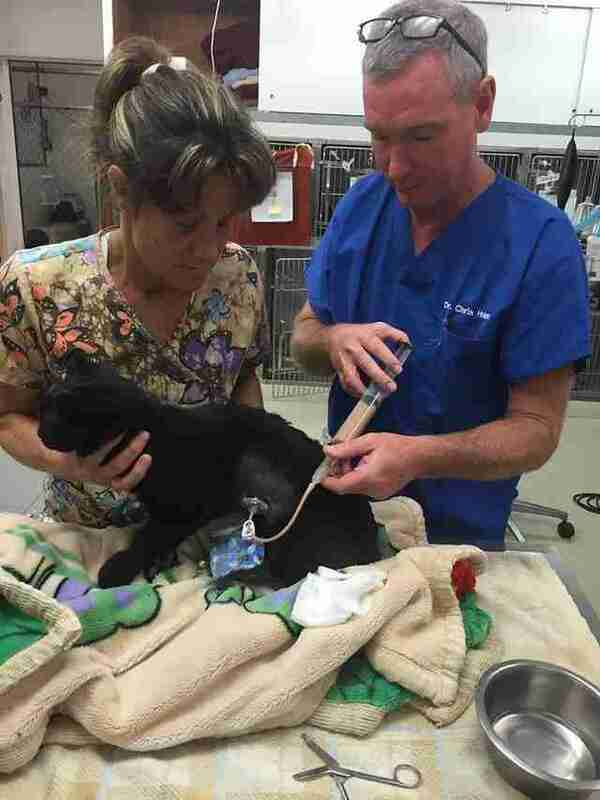 The fact that they're doing everything they can for this cat does not surprise me." Just a few days after being rescued, the cat is already looking much better. The clinic is optimistic that the cat's owner will recognize him and come to claim him, but whoever that may be is far from alone in having lost a pet. Since the Valley Fire began on Saturday, scorching 70,000 acres as of Wednesday, countless animals have been injured or displaced - though like this cat, they aren't necessarily without care. His is a story of hope. Volunteers have so far rescued hundreds of animals from the disaster area and are working to find more so each can be reunited with their owners. These Facebook pages have been set up to assist in their efforts: PET Lost and Found for Lake County Fires and Lake County Lost or Found Pets. Click here to learn more about how you can help animals affected by the fire.